Sales of framing lumber continued to lag production, as supply-demand imbalances were noted across the spectrum of the distribution system. Prices sagged in most species, grades, and widths. Buyers reported some encouraging signs in end-use markets, but ample supplies in the secondary market resulted in a lack of orders reaching back to the mill level. 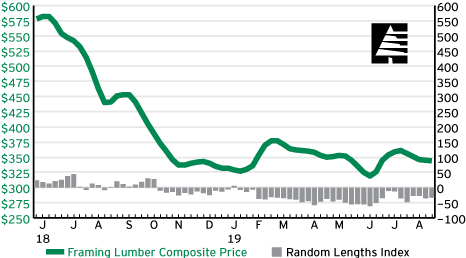 Prices continued to erode, and the Random Lengths Framing Lumber Composite Price fell for a seventh straight week. 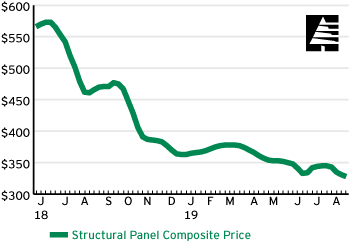 Structural panel sales were a grind, and prices faded. The weather-induced malaise that has bedeviled the OSB market for most of 2019 remained intact. In Southern Pine plywood markets, reported prices of rated sheathing eroded amid steady trading that failed to move beyond buyers covering immediate needs. Pressure on western Fir plywood producers to sell sheathing into a market lacking demand persisted. Most Canadian plywood producers experienced little interest from customers.